SECTORS EXHIBITING RECENT STRENGTH: Metal (Proc./Fabrication), Medical (Products), Software (Medical), Software (Gaming), Oil/Gas (Refining/Marketing), Oil/Gas (Transport/Pipeline), Electronic (Semiconductor Manufacturing), Electronic (Semiconductor Fabless), Wholesale (Electronics). SECTORS EXHIBITING RECENT WEAKNESS: Computer (Data Storage), Computer (Networking), Telecom (Infrastructure), Energy (Solar), Commercial Services (Staffing), Retail (Discount/Variety), Oil/Gas (Drilling), Electronic (Scientific Measuring Equipment). OVERVIEW: On Friday the market finally decided to shake off concerns of trade wars and responded well to a blistering unemployment report. The indices continue in a confirmed uptrend that was initiated with a rally on 4/4 and was confirmed on 4/10 with a follow thru day however, it has not necessarily been smooth sailing. 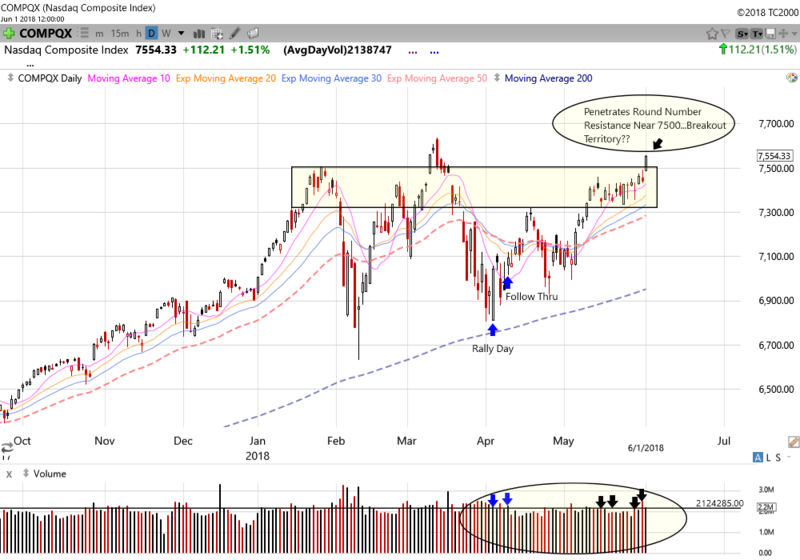 While the small caps have led and acted well relative to the rest of the market, the current rally was met with heavy selling in late April that sent the S&P 500 back down to test its 200 day moving average to start the month of May. Since then small caps and tech stocks have had an easier time of it while the S&P 500, along with industrials, have lagged behind. We noted to clients at the beginning of the year that 2018 market surely would not resemble the 2017 market and that has definitely been the case. The S&P 500 was in a tenuous spot early in the week as it broke below a key level near $270 piercing its 50 day exponential moving average in the process. The bulls needed a strong end to the week to eliminate a bearish picture for the index and participants delivered. Now, let’s take a closer look with charts of the four indices we cover here. SPY- The S&P 500 ETF, that we like to use here to track the index, was painting a bearish picture mid-week with heavy distribution days on Tuesday and Thursday, but bulls delivered a much needed shot in the arm on Friday as they pushed the index up nearly 1%. 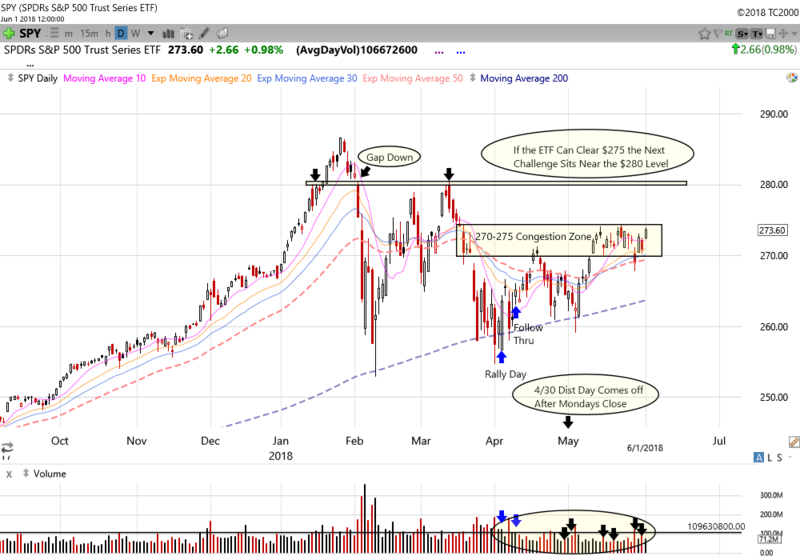 The close put the ETF back into a congestion zone between $270 and $275, but more importantly put it back above the key support level that sits near the April highs, and also back above its 50 day EMA. The distribution picture, which currently sits with six days, will improve slightly with the 4/30 session coming off the books after Mondays close. A push out of the congestion zone that eclipses $275 will start to paint a much more rosy picture for the S&P, but another challenge awaits not too far above near $280. NASDAQ- The tech heavy index paints a much brighter picture as it is now threatening all-time highs. The Composite advanced 1.5% on Friday easily dicing thru the round number resistance level of 7500. The move can be viewed as a major breakout. Breakouts can originate from handle like areas near the top of their base even though prices are still slightly below prior highs. This particular base has been forming for nearly three months since the index peeked in early to mid March. That’s said, the old high that sit near 7637 can still present an obstacle. From here, some follow thru on strong volume above the old high will legitimize the breakout attempt. The index loses the 5/2 distribution day due to the 6% advance since then, leaving it now with only four in the current count. QQQ- The Nasdaq 100 paints a similar picture as the index broke thru resistance on Friday on solid turnover. We previously noted the bullish candle the index printed at support near $167.00 on 5/23 which helped lead to this weeks push above resistance near $171.00. We will see if the old highs near $175 on any further advance present an obstacle for the index. IWM- While the Nasdaq Composite and Nasdaq 100 are trying to put together fresh breakouts to new all-time highs, the Russell 2000 already sits with a new all-time weekly closing high. Small caps broke out on 5/16 and pulled backed to successfully test that level on 5/29. The index is now up over 10.5% from the initial rally day it posted on 4/4. The advance from this area has been more orderly that of its peers and it has achieved this with little to no signs of distribution in the process, in fact, the index picked up its first distribution day on Thursday in the last several weeks. The successful retest of the breakout on 5/29 makes us more confident than we were last week that the advance in the index can continue. For real-time stock and option trading alerts we are making for our own accounts, join Greg Krupinski of GK Trading, along with myself, at http://www.ttptrading.com You get access to all of our content we offer on the site for one low price with no long term commitment. Hope to see you there soon!